Having finally found the fall colors I went in search of along the Eastern Sierra near Mono Lake, It was time to turn my car towards home. It’s a long, long drive! I was hungry and needing gas. 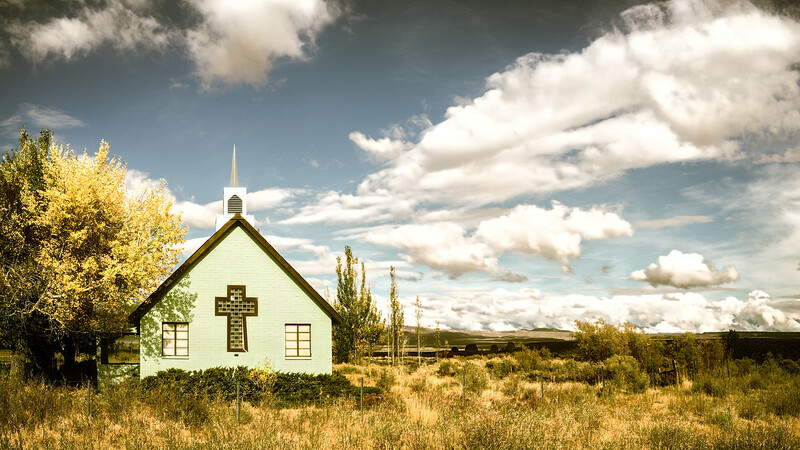 I was heading towards the town of Bishop when I passed this lonely little green church along highway 395. I just had to make a U-Turn and check it out! There wasn’t much of anything for miles around and the church seemed to be abandoned. I wondered about what this church was like in it’s day and wished I could see inside. Such a cool, unexpected find. I finished up my visit with the little green church and got back on the highway. So HUNGRY! No more stops, I told myself. Bishop was less than 20 miles away, it was getting late in the day and I still had one other stop I wanted to make on the way home. But, you guessed it…there is always something else to see out there on the road. The clouds were amazing coming over the foothills with the afternoon light coming behind them. That’s when I spied a “vista” turn out. It’s only a couple of minutes, so I stopped for a shot. One more road shot “in the can” and it’s off to Bishop for a quick bite to eat and a full tank of gas. 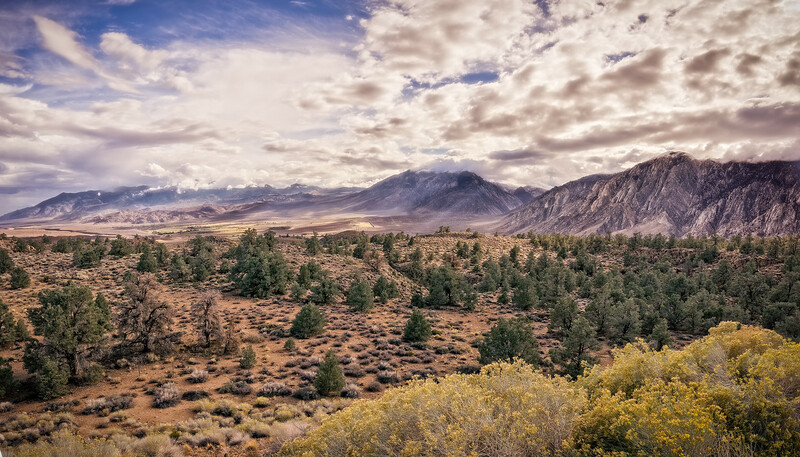 With mine and my car’s needs met, I drove towards the town of Big Pine 15 miles to the south. There I would find the highway 168 turn off that would take me up to see the Bristlecone Pine Forest. I had tried to reach the forest on my way north earlier in the day, but turned back due to the rain that had pooled on the road. I could see mud starting to flow onto the street and feared that if the rain didn’t let up, I’d get stuck. Now that the storm had passed, I figured I’d try again. The first 13 miles on Highway 168 is winding, but a good drive. The next 11 miles on White Mountain road is steep, winding and very narrow with sheer drop offs. Yikes!! So glad I didn’t attempt this in the pouring rain! Even dry, I didn’t like it. The things we do for the sake of adventure! Or maybe I’m just a chicken? I finally arrived at Schulman Grove just as the sun set behind the distant mountains. I didn’t stay long, really not more than a few minutes. I needed to be here earlier and there was no way I was coming down the mountain in the dark. I grabbed a couple of photos of the fabled trees and headed on down the mountain. From Schulman Grove, there is a 12 mile dirt road (I’ve read it’s of good quality) that will take you to Patriarch Grove. There you will find even more surreal trees. I will definitely be back to explore this area more completely. As I came down off the mountain into the town of Big Pine, the stars were just coming out. It’s been a great time on the road, but it’s time for the long trip home. Can’t wait to see where the journey takes me next! I hope all your journeys are good ones, and don’t forget to take the long way home! Check out my Gallery for full sized photos from this trip. 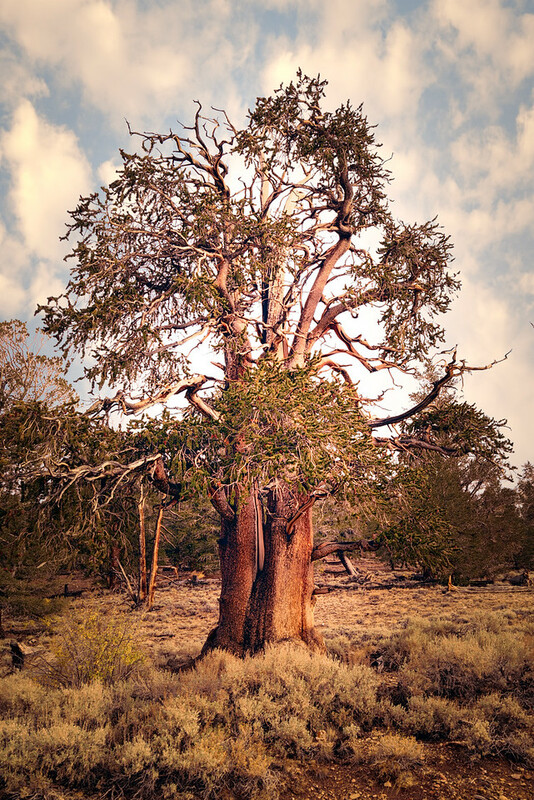 More information about the Bristlecone Forest can be found here. I'm a landscape and travel photographer, blogger and apprentice/protege at the Arcanum. I'm happiest when out on the road seeing new things and finding new adventures. Thanks, Molly! I appreciate that! This is awesome Lisa. I’m going to have to follow your trip here! Thanks for the info!